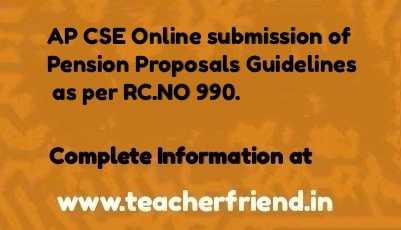 Home» AP LATEST UPDATES » AP CSE Online submission of Pension Proposals Guidelines as per RC.NO 990. AP CSE Online submission of Pension Proposals Guidelines as per RC.NO 990. AP Commission of School Education CSE Guidelines by Pensions Online submission of Pension Proposals Development of Web application by DTA Government Orders for implementation of application on pilot basis Certain information as per Rc.No. 990/Pension-1/2017. Dated: 18/01/2018. CSE Pensions Online submission of Pension Proposals Development of Web application by DTA Government Orders for implementation of application on pilot basis Certain information as per Rc.No. 990/Pension-1/2017. Dated: 18/01/2018. The attention of all the District Educational Officers and Regional Joint Directors of School Education in the State is invited to the reference 5th cited, wherein they were requested to submit the names of concerned Senior Assistants/Junior Assistants/Superintendents and Assistant Directors along with their phone numbers who dealt with the pension section in the following proforma for implementation of application on pilot basis i.e., online submission of pension papers as per G.O.Ms.No. 176, Finance (HRV-Pensions) Department, dated 22.112017. In this connection, all the District Educational Officers and Regional Joint Directors of School Education in the State (except District Educational Officer, Vizianagararn, Visakhapatnam, Guntur and Prakasam) are once again requested to submit the information on or before 23.01.2018 without fail otherwise the responsibility will be fixed for the delay for taking departmental action as per rules.